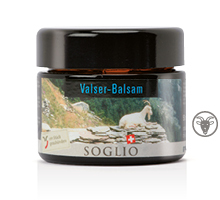 For years our manufacturer obtained goat butter oil from the Vals valley. Sadly, our initial distributors have ceased production. This is why we decided to take over their processor for the conversion of goat butter to goat butter oil, and to manufacture this valuable product ourselves in Castasegna. Since summer 2016 we have obtained our goat butter from the “Hosang’sche Stiftung Arbeitsstätte Plankis” in Chur. In the following few sentences we would like to introduce this institution to you, dear readers. The foundation, established in 1845, has until this day connected welfare living with occupations that align with the aptitudes and skills of its members. Today adult people with disabilities reside in 45 living spaces in various living forms, and are employed in 80 sheltered work and training places in bakery, floristry, gardening, home economics, crafts, food production and agriculture. Next to cows, horses and chicken, the certified organic estate also accommodates 100 Chamois coloured goats. Goat milk is processed on site in a newly built alpine dairy – may it be to cheese, yoghurt, milk drink, as well as butter. Balm for a soothing care. 33% goat butter oil with wheat germ oil, olive oil and beeswax in this special composition open the pores by which the skin can better absorb the nutritious ingredients. Soothing after sport activities and hiking. Contains peanut oil. 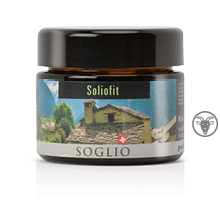 Soliofit with hemp seed oil nourishes and revitalizes after extensive physical exertion. 33 % goat butter oil with wheat germ oil, spiraea oil and beeswax in this special composition open the pores by which the skin can better absorb the nutritious ingredients. Balm for your whole body. Contains peanut oil. Suitable for adults and children over 3 years.